Sparq Natural Gas CEO Norman Herrera fills a pickup truck with compressed natural gas in front of the Oklahoma Environmental Management Authority office in El Reno Friday. El Reno installed a compressed natural gas station for its refuse fleet. It’s part of a larger trend of municipalities relying on the fuel for its services. The Journal Record’s Sarah Terry Cobo writes Oklahoma Environmental Management Authority owner David Griesel says the dispensers save time and money. Griesel has eight CNG trash trucks now, which can be filled up slowly with the fuel at night. Before employees had to drive to Yukon to buy CNG at a retail station, taking them out of the way, and wasting time. Since his employees have used the new dispensers, they’ve shaved nearly five hours off their daily route. CNG trash trucks are more efficient and less expensive, according to Journal Record editor Ted Streuli. He told KGOU they’re also more reliable than diesel trucks. Availability remains a hurdle at the moment because CNG filling stations are not as ubiquitous as diesel and gasoline. While Oklahoma is a good fit for CNG due to the state’s oil and gas production, Streuli says it could be plausible anywhere through the pipeline network. At the moment, the only thing blocking more widespread use of CNG across the country is investment costs. “The hurdle really is the cost to upgrade the pipeline and put in the pumping station, and unless there’s a lot of CNG demand in that area, few are willing to risk that kind of investment,” Streuli said. The primary downsides of CNG for trash truck fleets is that it takes a long time to fill up a tank - usually overnight - and the resale market is a little bit smaller. JACOB MCCLELAND: Ted, let’s start by talking about Compressed Natural Gas, or CNG. El Reno just put in a CNG station for their refuse truck fleet. Why are more communities using CNG as motor fuel for their trash trucks? TED STREULI: Well they told us that they are both more efficient and less expensive. So what they’re finding is the CNG trucks are cheaper to maintain. They’re more reliable than their diesel counterparts, and they are better able to meet air quality standards. A CNG trash truck costs about $15,000 to do an engine overall, whereas a diesel truck could cost more than double that, as much as $32,000. The fuel is consistently cheaper, they’re cheaper to work on, and they tend to be more reliable. That’s a pretty good incentive. MCCLELAND: What are some of the limitations of CNG as a motor fuel, for a personal car or truck for instance? STREULI: Well, really Jacob the biggest hurdle at the moment remains availability. There just isn’t a CNG fueling station at every single exit on the Interstate like there is for gasoline and diesel. That’s changing a little bit. There is certainly a lot more availability now than there was 5 or 6 years ago. But we don’t see it on every corner yet. MCCLELAND: Is Oklahoma just kind of a good fit for CNG due to natural gas and oil production here? Is it as feasible to use CNG in a place that doesn’t produce natural gas, like Maine? STREULI: Well, Oklahoma is certainly a good fit because we’re so close to the source. But really it’s plausible anywhere there’s Natural Gas available, and that’s just about everywhere in the country thanks to our pipeline system. The hurdle really is the cost to upgrade the pipeline and put in the pumping station, and unless there’s a lot of CNG demand in that area, few are willing to risk that kind of investment. MCCLELAND: What are some of the downsides of using CNG for a trash truck fleet, for instance? 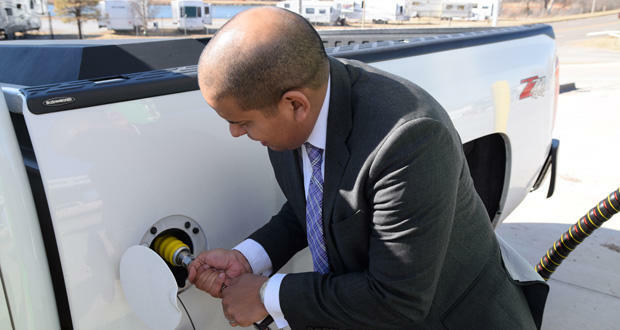 STREULI: Well, one is the CNG usually dispenses slowly overnight to fill those trucks, so it’s not the same as pulling into a station for 10-minutes and filling up with diesel if a truck is running low. They have to plan those fill-ups overnight. And the resale market for those trucks is a little bit smaller, too, because CNG powered trucks are not as ubiquitous as diesel or gas. But with a known lifespan and that planned nightly fueling, the negatives are quite minimal..
MCCLELAND: Let’s turn our attention now to a story by Brian Brus. Oklahoma City’s Christmas retail sales were down again this December. The city has had a long string of months with lower sales tax figures. Why can’t the city shake this slump? STREULI: The city is really blaming this on the protracted downturn in oil prices. With less money flowing from the energy companies and the employment uncertainty that they’ve had, people are tending to hang onto their cash rather than spend it. MCLELAND: What are city leaders planning to do to increase retail sales, if anything? STREULI: Well, Jacob, there really isn’t a whole lot they can do. They’re just sort of hoping oil makes a comeback and the money starts flowing a little more freely. MCCLELAND: Do city leaders see Senate Joint Resolution 11, which allow city to adjust ad valorem tax rate, as a possible solution here? STREULI: Well they certainly do, and that would be a really big change in Oklahoma where cities are really restricted in what kind of taxes they can collect. Sales taxes make up more than 50 percent of their budget. What they’re talking about doing in this joint resolution is increasing the millage rate by two points. What that means is that a home assessed at $150,000 in Oklahoma County would see an increase in annual property tax from $1,777 go up to about $1,808. So it’s not a huge amount, but it would make a vast difference for the city coffers. MCCLELAND: We’ve been talking today to Ted Streuli. He’s the editor of the Journal Record newspaper. Ted, thank you so much for talking to us. It’s been a pleasure.